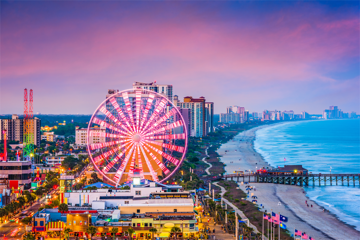 Myrtle Beach, South Carolina, is one of the top seaside destinations on the East Coast, with more than 60 miles of Atlantic coastline (referred to by locals as the Grand Strand). During prime season, the beaches are often packed with families soaking up the sun, flying kites, and kids building sand castles. 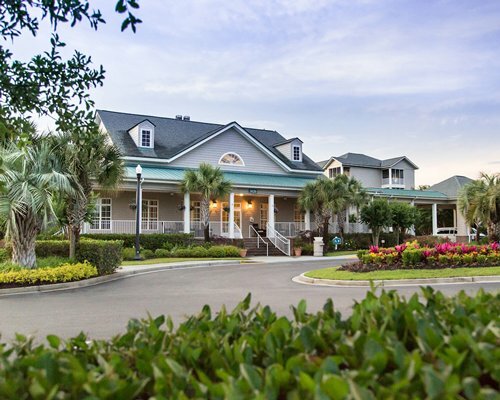 If you’re not a beach bum, fear not: The communities surrounding Myrtle Beach are also home to championship golf courses, live-music venues, theaters, and nightlife hot spots. If you take a stroll along the area’s new 1.2-mile-long Oceanfront Boardwalk and Promenade, you’ll find a smorgasbord of attractions—seaside restaurants, boutique gift shops, family-friendly theaters, and even an observation Ferris wheel. 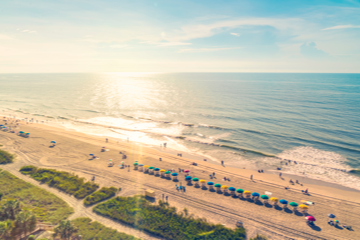 The natural beauty of Myrtle Beach is also undeniable, whether you’re perusing a quiet fishing village or walking a tree-lined avenue. Come evening, the area is abuzz; nightlife aficionados will have no shortage of live-music venues and lively dance bars from which to choose. 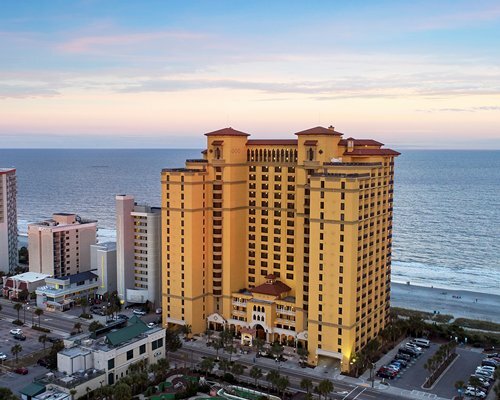 Though the experiences are diverse, there are two things you can count on no matter where you go in Myrtle Beach: a relaxing way of life and plenty of Southern hospitality. 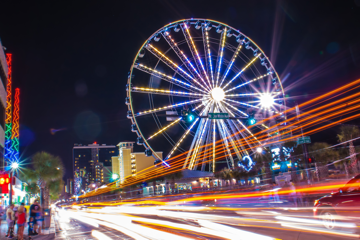 There are so many different things to sample in the Myrtle Beach area—miniature golf, spas, musical revues, shag dancing, outlet shopping, amusement parks, beachcombing. The crews who dug the Intracoastal Waterway in the 1930s probably didn’t have a clue about what would spring up in their wake. 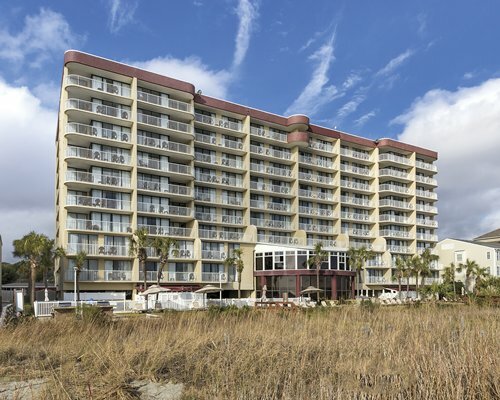 Tame Myrtle Beach’s array of enjoyments with a gameplan. What’s happening in this popular southern vacation spot. The crews who dug the Intracoastal Waterway in the 1930s probably didn’t have a clue about what would spring up in their wake. But when they connected inland rivers at the northeastern tip of South Carolina and continued some 60 miles southward, they birthed one crown jewel of an island. "Nice location with lots of great restaurants close by." "The resort was perfect for us." "It was quiet, and clean with very friendly, helpful staff members."